The same week as the aftermarket-friendly PARTS Act saw another bipartisan Senate bill with the potential to affect auto repairers. The Federal Vehicle Cost Savings Act, introduced Feb. 26 by U.S. Sens Gary Peters, D-Mich., and James Lankford, R-Okla., encourages remanufactured parts in government vehicles. It unanimously passed the Senate Homeland Security Committee on Wednesday, Peters said in a news release. 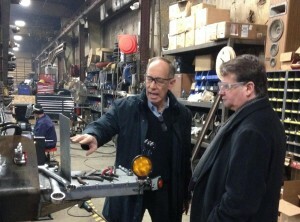 Remanufactured parts are used ones that have been refurbished to “same-as-new condition,” Peters’ news releases state. Their use is discouraged by collision repairers, who have raised quality issues with any non-original equipment manufacturer parts. Their lower cost also could affect your body shop’s revenues. Senate Bill 565 defines a remanufactured part as “a vehicle component (including an engine, transmission, alternator, starter, turbocharger, steering, or suspension component),” but presumably the parenthetical is not meant to limit the bill’s scope to those parts. The bill only allows the use of such parts if they save money, keep the vehicle performance the same or better and don’t increase repair times. The two new senators had sponsored it last year in the House, the Detroit News reported. Peters, who appears to be biting the hand of his state’s most famous industry by snubbing OEM parts, said in an earlier release that it was his first Senate bill. The senators said a Government Accountability Office study they commissioned found that their bill would cut expenses for 588,000 government vehicles, which cost about $1 billion a year to repair. The study found the U.S. Postal Service and Interior Department already used the parts to save money. MEMA is the parent organization for the Motor & Equipment Remanufacturers Association. The senators said remanufacturing auto and off-road parts yields more than 51,000 full-time jobs. With a Republican Congress focused on saving money, the bill certainly has a chance. However, their 2014 proposal failed to go anywhere in what was then a Republican-dominated House too. House Resolution 4056 was sent to the House Committee on Oversight and Government Reform, which took no action.